When you talk to people about running, more often than not, they conjure images of big road races, where they’re one of 1,000+ other runners careening down a major city street. Many people don’t realize that there’s a more therapeutic type of running out there that’s actually more meditative and invigorating: trail running. Better yet, trail running is just as good for your health as road running. Trail running is a type of moving meditation. 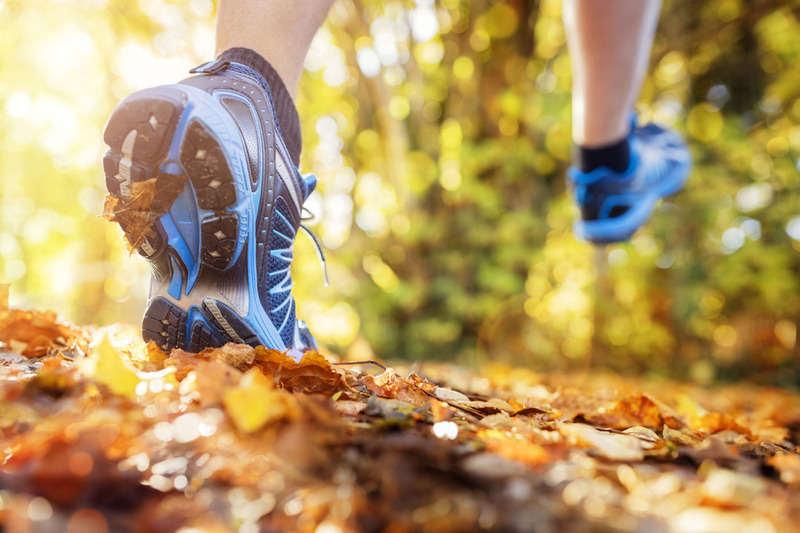 When you’re running and working toward achieving the flow that Mihaly Csikszentmihalyi has written about, not only are you doing something good for your cardiovascular health, but you’re also doing wonders for your mental health, too. While running is hard work — it’s one of the hardest things each of us was born knowing how to do, in my opinion — after a while, strangely enough, it can become one of the most relaxing, hardest things you do. Still not convinced? Below, I’ll describe in further detail how trail running is a type of moving meditation and a practice that, if you’re not already immersed in, you should seriously considering taking up sooner rather than later. Trail running connects you with nature. By its very essence, trail running deposits us in the wilderness, sometimes seemingly worlds apart from the hustle and bustle of everyday life. It doesn’t matter if you’re running through the woods near your home or up the side of a mountain; what matters most is that trail running allows you a chance to get into nature’s playground — think of it as recess for adults — and to fully immerse yourself. Simply seeing pictures of nature can be enough to relax and rejuvenate adults in office settings, so imagine what it can do for you if you’re actually in it? Trail running allows you to unplug if you’d like to. Closely related to my above point, trail running is a fantastic way to unplug from the brouhaha of daily life. Sure, you can still run with your phone and take pictures and movies of your exploits if you’d like to, but it’s just as good if you decide against it. It can be exceedingly difficult for us to unplug and unwind from our thousands of daily commitments, but immersing ourselves in nature and going for a run can be an excellent avenue to do that and a fantastic way for us to re-center ourselves and re-align ourselves with our daily goals, priorities, and intentions. Trail running often sets a pace slower than usual. Sure, there are some people out there who are athletically adept and who can blaze through trail miles, but for the majority of us, we tend to take things a little more gingerly when we’re running trails. More often than not, the varying trail terrain dictates our decreased pace — particularly if we’re running uphill, downhill, or on some super tricky and technical, root- and rock-laden footing — and that’s just fine. You can still get a great workout and still experience the coveted “runner’s high” — an endorphin rush — when you’re running trails and going more slowly than usual. Sometimes slowing down, or stopping altogether to smell the roses, can be an extremely moving and meditative experience. Trail running can give you perspective. Finally, one of trail running’s most lasting effects on its acolytes is in its uncanny way to give us perspective. So often, we get bogged down in the minutiae of daily life that we fail to see the forest through the trees. Running trails — and experiencing nature in all its glory — allows us to keep everything in perspective and realize that our problems are probably more inconsequential than they seem to us. If you need a way to augment your current meditation practice, consider incorporating trail running into your regiment. Not only will you be able to experience the great runner’s high, but you’ll also be able to both become relaxed and rejuvenated in the process — all while experiencing and appreciating nature and all her wonder up close and personal. A professional runner and vegan. Acting at the nexus of aesthetics and intellectual purity to craft experiences that go beyond design. She also writes reviews and recommendations on Runnerclick, ThatSweetGift, NicerShoes and GearWeAre.